On Wednesday, Premier League giants Chelsea purchased Christian Pulisic from Borussia Dortmund for an astronomical €64 million (nearly $73 million). After finishing out this season in Germany, the winger will officially become a member of one of the biggest clubs in the world, in the best league in the world, this summer. The idea that Pulisic would one day be good enough to get swooped up by a major club had lingered ever since he broke through at Dortmund as a teenager, but now it’s a reality. So what happens next? It’s hard to get past the transfer fee, the biggest ever paid for an American three times over and one that solidly screams “superstar potential” for the former Wonderteen. It wasn’t so long ago that only the very best players in the world could command a price tag similar to Pulisic’s, but American fans should try to avoid getting too carried away about Pulisic’s immediate future based solely on how much Chelsea were willing to pay for him. Chelsea are doing what most teams have begun to do in the post-Neymar inflation era: buy early and hope for a winning lottery ticket. A 20-year-old squad player is not worth $73 million, but a 20-year-old squad player that turns into a 22-year-old star definitely is. Chelsea may not believe that Pulisic is a lock to become a true superstar, but given how much true superstars cost these days, they felt $73 million was a fair price to pay for the chance that Pulisic might eventually turn into one. It’s a similar bet to what Barcelona did in the summer of 2017 with another Dortmund phenom, Ousmane Dembélé. The Catalan club dropped an obscenely large bag (€115 million) for the then-20-year-old Frenchman, in hopes that he would eventually slot in next to Luis Suarez and Lionel Messi on the front line as the next big star. It took him some time, but it appears that Dembélé has finally started to click with the two South Americans, and most Barcelona fans will likely be pleased with his progress this season. Chelsea has their own talismanic superstar for Pulisic to work off of in Eden Hazard, though there are questions both to how the two would fit and whether Hazard will even remain in London in the near future. The Belgian has been linked to Real Madrid for years, and with the Spanish giants struggling domestically this season, perhaps it’s finally time for them to pull the trigger on Hazard, especially as he enters the last year of his contract this summer. The fit question with Pulisic is more interesting, however, if Hazard does remain a Blue. Despite what can be called a disappointing 2018, Pulisic has plenty of talent and his style of play seems to fit well into Maurizio Sarri’s philosophy at Chelsea. 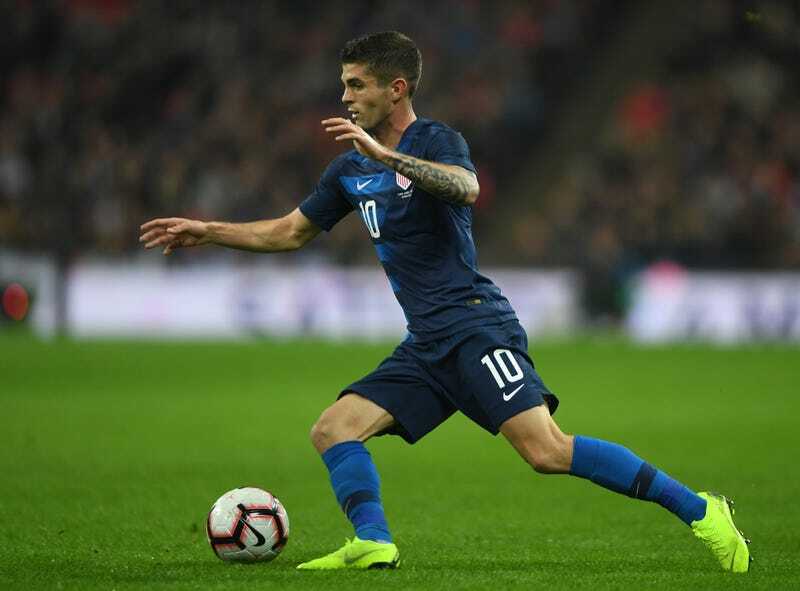 That style of play involves constant movement and positional awareness from all attackers, and for all his existing flaws, Pulisic has both the pace and the intelligence to adapt his game to provide a fine counterbalance to Hazard in a Sarriball system. Is a “fine” player what Chelsea hope to get for their big investment, though? Therein lies the problem with the Pulisic transfer, and the way we talk about promising American players as a whole. At the club level, Pulisic has been clearly eclipsed by English winger Jadon Sancho, and at times has even found himself behind fellow 20-year-old Jacob Bruun Larsen in the pecking order. When he has gotten on the field this year, Pulisic has been good, but not great, with a tendency to lose the ball as he tries to over-dribble on the right. His defensive work rate is solid, but he doesn’t have the ability to properly cover the flank, as his defensive fundamentals are poor, to be kind. To say he’s worth $73 million for just what he’s shown at Dortmund is insane, even when taking into account the inflated prices that Premier League sides always seem to pay in the transfer market. But we passed the insanity line in soccer transfers long ago, and at least Pulisic is going to a club that has a playing style that should elevate his game. Under Sarri, Chelsea’s right wingers—the position Pulisic will hope to make his own over Pedro and Willian, both of whom could be departing this summer—must provide width and defensive cover, allowing Hazard to go wild on the left. That means Pulisic will have to up his commitment to defending, even if he has N’Golo Kanté and César Azpilicueta on his side of the pitch to help out. It also means he will have to cut down on the ball-hogging dribbles, focusing instead on making smart runs and inter-changes to make himself a target for Hazard’s magical assists. Chelsea’s attack generally flows from the left, so there will also be significant periods where Pulisic just will not get the ball, and he will have to remain committed to movement without it for long stretches. Pulisic has the tools, if not the track record, to slot in perfectly as a rotational piece for a team that demands top-four finishes year in and year out. Is he good enough to be one of the best three or four players on a Premier League-winning side? No, probably not, at least not right now. But Chelsea’s current level—consistently pushing for Champions League appearances, but clearly on a tier below Liverpool and Manchester City—does feel right for Pulisic, particularly if the team sells at least one of the aforementioned wingers before he arrives next season. As long as fans don’t expect him to be a superstar right away (or ever, for that matter), Pulisic should be a hit in London. He’ll have his share of struggles, and the transfer fee will get thrown in his face by the savage English media, but there are few clubs better positioned to let Pulisic succeed than Chelsea. As long as they’re okay with him being a good squad player and nothing more, American fans should be excited about having one of their own at a club of Chelsea’s ambitions.